If we're friends on Facebook, you may remember that I threw down a culinary gauntlet for myself at the advent of the New Year. I set three culinary goals for myself for 2014, and one was a leftover from last year that I never got around to: making Boeuf Bourguignon. But not just any old Boeuf Bourguignon - Mastering The Art Of French Cooking's Boeuf Bourguignon. 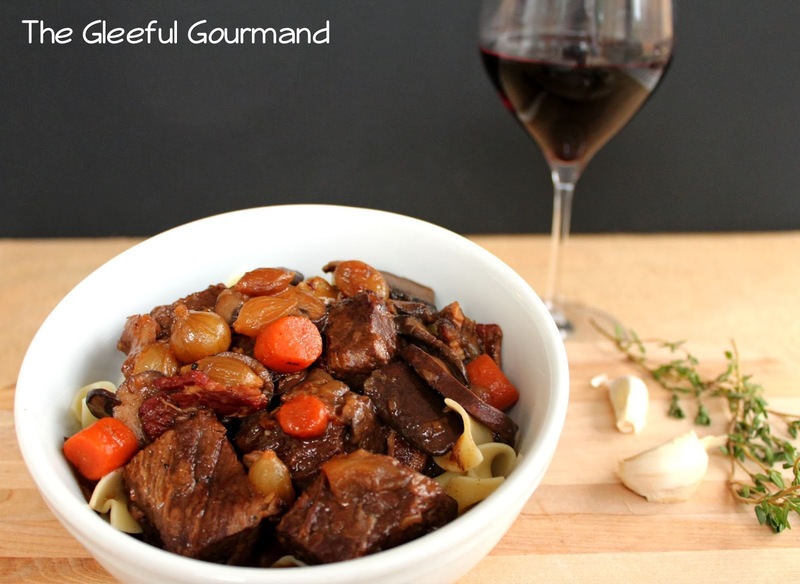 Otherwise known as Julia Child's Boeuf Bourguignon. 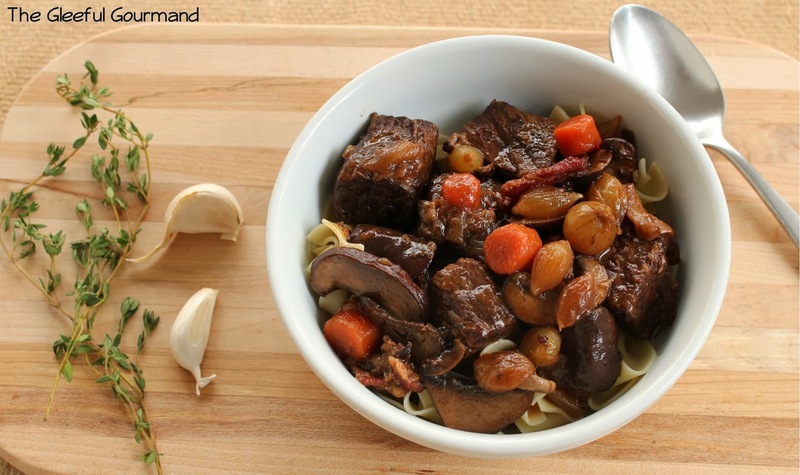 Boeuf Bourguignon, or Beef Burgundy, is a classic French dish that hails from the Burgundy region. Calling it Beef Stew doesn't do it justice. Mastering The Art of French Cooking remarks that it is, "certainly one of the most delicious beef dishes concocted by man." If you've ever taken a look at the full recipe, you'll know that it's quite an undertaking. Almost every recipe in that cookbook is, come to think of it. That's what makes French cuisine so great, I think. They don't cut corners. They know that lovingly tending to something you care about will yield amazing results. Even if it takes 4 hours and around 15,000 steps (give or take). I discussed this with the butcher at my local Whole Foods. I was looking for the first ingredient: a bacon slab with the rind still on. "We don't have that," he said apologetically. The other butcher, a woman, was cutting the beef I had requested for stewing into 2-inch cubes. "No one does that anymore. You just won't find bacon that still has the rind available," she said. "Just out of curiosity, what are you making?" The male butcher asked. "Boeuf Bourguignon. From Mastering The Art of French Cooking," I told him. He nodded in understanding. "Oh yeah. I think they add things like what you're looking for in those recipes just to torment the butchers," he laughed. "Believe me when I say: I know that recipe, and you don't need the rind one bit. Don't sweat it." 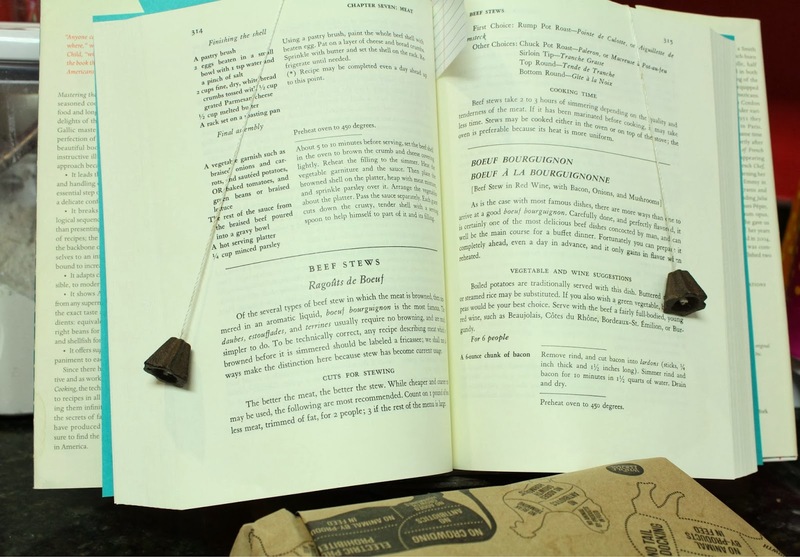 We talked some more about the book and the recipe, and I put the precious parcels of bacon and beef in my cart. "Good luck!" said the female butcher. "Hey," added the male butcher as I turned to go, "Just remember, make it your own and have fun." That exchange is just one small reason why I love Whole Foods. But fun wasn't exactly what came to mind when I thought about tackling this mammoth recipe. However, his remark made me smile broadly, and I felt a little lighter leaving the store. Why couldn't this be fun? I had read the recipe about a dozen times. I had all the ingredients, and had mapped out carefully what I was going to do, when I was going to do it. I wasn't going to leave anything to chance. The kids were being looked after for the entire afternoon by my husband, kept out of the kitchen by whatever means necessary. It was time to finally do this. If for nothing else than to prove to myself that I could do it. That is, after all, why we take on challenging recipes, isn't it? To grow, to learn something, and to prove our culinary worth to ourselves. I started at 3:00 p.m. I already knew, thanks to the lack of bacon rind, that I wasn't going to be able to replicate this recipe precisely. But I was going to try and replicate it as close as I possibly could. And that meant simmering the bacon lardons (bacon cut into 1/4 inch sticks) first before browning it. Apparently that first step is meant to take the smoky flavor out of the bacon. Though why you'd want to do that, I haven't a clue. But no matter, I was in the throes of the first steps, and if Mesdames Child, Beck, and Bertholle said to do it, by gosh, I was going to do it. Here's what actually took up most of my time: browning the beef. The recipe recommends that you brown the chunks of beef a few at a time so as not to bring down the temperature of the oil and bacon fat (it also makes it very clear that you have to carefully dry each piece, or it won't brown). I did about four at a time, but it was tedious work. 3 pounds of beef is actually quite a lot. Browning the beef in olive oil and bacon fat. The time marched on, and soon I found myself pouring an entire bottle of wine into the pot that held the beef, carrots, sliced onions and bacon with beef stock. I had to smile to myself as I recalled the second great conversation I had that morning at Whole Foods, this time with their wine expert. I had been standing in the French wine aisle, looking at my choices, and not really sure what to do. There were a couple of choices for Burgundy wine, but all of them were upwards of $30. Not only did I need to pour a whole bottle into the stew, I also wanted a second bottle to actually drink with dinner. The recipe recommended a couple of other choices that would do, but I didn't write them down, and couldn't recall. 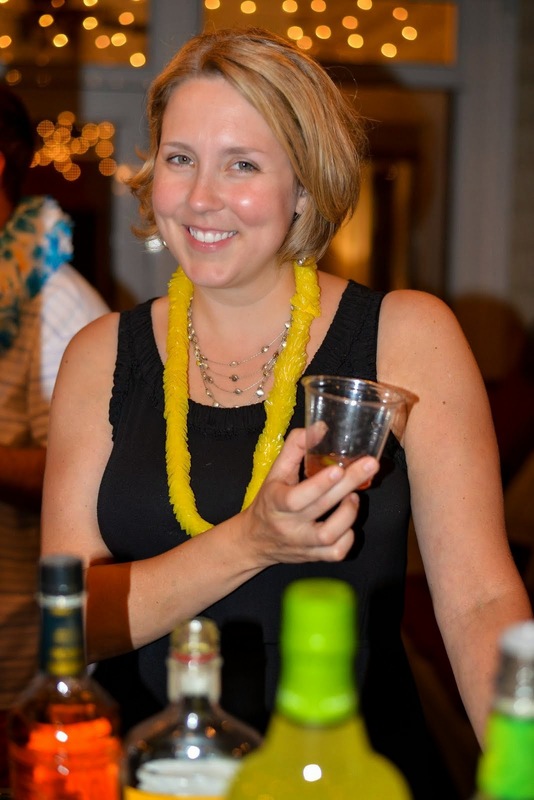 The wine expert sidled up to me and I explained my dilemma. "What are you making?" He inquired. I told him, and he smiled, beckoning me to come with him. To the discounted wine aisle. "Here's the thing about Burgundy. It's good, but it's ridiculously expensive here. What you really want is this Pinot Noir. The grapes in the Pinot Noir are the same grapes used in Burgundy. Of course, this one comes from Chile, not France, but it will do the exact same thing, and it is delicious. It's also $6.99." He handed me a bottle of Pepperwood Grove Pinot Noir. "And of course, you're going to want a second bottle to drink with dinner, right?" He asked with a knowing smile. He also wished me good luck as I walked away. For the record, the wine was delicious. I knew that immediately because after I added the three cups to the stew, I had some left over in the bottle and took a swig to try it out. When in France, right? Into the oven the stew went, and now I had about 2 1/2 hours to wait. I took that time to do the dishes and to make the last couple of steps: braising the pearl onions with a bundle of herbs, and sautéing the mushrooms. This, of course, made extra work, but I knew as the onions browned gently in my cast iron skillet, and the aroma of them simmering in beef stock hit my nose, that it was going to be worth it. I only realized too late after slicing all the mushrooms that they were actually supposed to be quartered. Normally, in such a concentrated state of cooking, that would have shook me up, but I just shrugged and powered on, setting a big pot to boil the egg noodles for the base of the stew. Braising pearl onions: An extra step that's worth the time. We finally sat down to dinner at 7:15 p.m. The kids were great - they had snacks to fortify them, and we inhaled the stew. It was beyond fantastic. I could very clearly taste all the different levels of flavor bursting from the stew in each bite. With each mouthful, I could understand how each different step added another layer of flavor, and also how they all worked together in harmony. At that moment of complete satisfaction that it had not only turned out okay, but that it was delicious, I didn't mind that my legs and feet hurt from standing still for so long, and that I was exhausted. I didn't mind the extra paces the recipe puts you through because I finally understood why it does. Mastering The Art Of French Cooking is insistent on time, patience, and understanding all the steps because it's not just a typical cookbook. Its authors weren't bent on making sure you turn out an okay meal on time - they were bent on the average home cook learning, growing, and understanding - truly understanding - French cuisine, from the very first bought ingredient to the finished product. They knew that no one can master anything if there isn't a high level of learning and understanding, and plenty of practice. They also knew the end result would be completely worth it. The wine was drained, our bowls wiped clean, and our bellies full. What better outcome could come from a New Year's resolution? This and hearing of your Valentine's Day dinner makes me want to move in! Congratulations!!!!!!!!!!!!! !